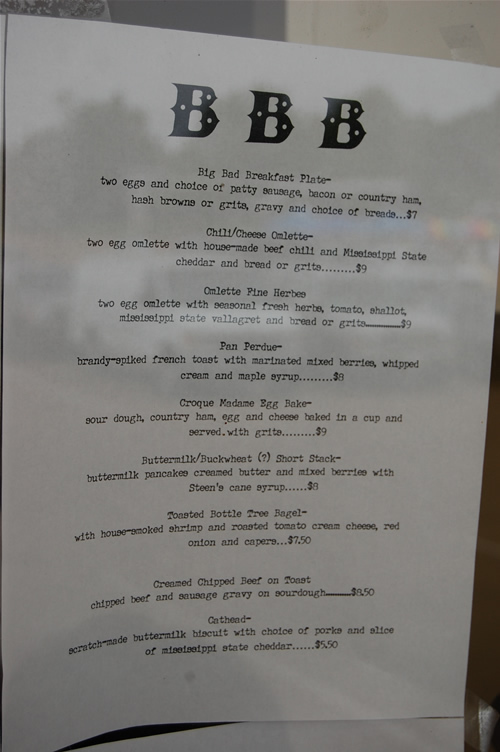 This week Chef John Currence, co-owner of City Grocery, will be opening his latest foray into the Oxford restaurant scene – Big Bad Breakfast. 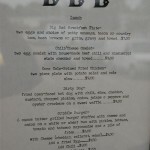 I came across BBB quite accidentally while hitting the Farmers Market on Memorial Day weekend when I noticed the sign was already on the building next to Market Rhys in the Mid-Town Shopping Center . As I inched closer, I realized the lights were on at BBB and people were milling about. “Go on in,” I was told by someone sitting on the concrete steps. 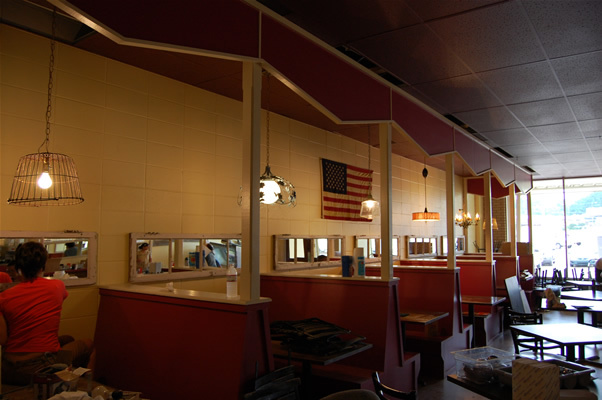 The atmosphere is country rustic with a hodgepodge of folk art, American flags, mixed lighting fixtures and lots of mirrors- most framed in distressed painted wood. A velvet Elvis adorns a back wall. 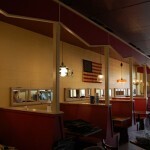 Red booths, an array of tables and a large wooden sign bearing the words “Weedpatch Camp” greet me upon entering. “John is a great forager,” said Jason Nicholas, a fifteen year employee of the City Grocery who worked his way up from dishwasher to co-chef at BBB. I notice Currence sitting on a barstool with his back against the counter and introduce myself. The staff is doing a sort of dress rehearsal in anticipation of Thursday’s opening and have invited family and friends in for a taste of what’s to come. I have fortuitously crashed that party. Currence offers me a free biscuit. I decline having just eaten a tenderloin biscuit from B’s on College Hill Road, but have felt like that Chris Farley character ever since- banging my head and pulling my hair, “Gosh, I’m so STUPID!” How often has a three-time James Beard Foundation nominee for Best Chef of the South offered me free food? If I don’t count the snack mix sitting on the bar of City Grocery during happy hour, I can tell you the answer is zero. Currence invites me outside. 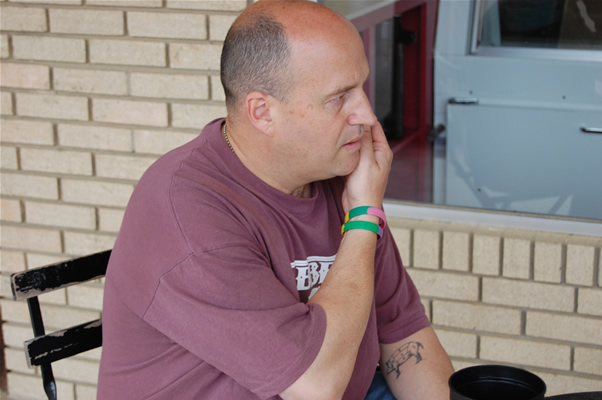 He pulls up a metal chair in front of the restaurant and lays a pack of cigarettes and lighter on a table. 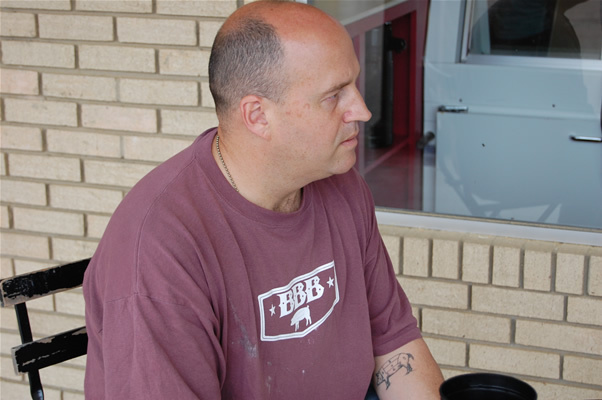 It’s humid outside and the chef is wearing worn motorcycle boots, torn jeans and a kitchen-weathered Purple t-shirt bearing the restaurant’s logo – BBB beneath a butcher’s diagram of the cuts of a pig – matching the one tattooed on his left forearm. I ask him about the new restaurant. “It’s something my wife [Bess] and I have been talking about for about ten years,” says Currence of the sixth one he has brought to Oxford since opening the City Grocery sixteen years ago. Like Ajax , Nacho Mamas, Kalo’s Tavern and Boure, Big Bad Breakfast will be run by former employees with the intent of putting them in an ownership position. Currence’s wife Bess and Jill Stevens will run the front of the house while Jason Nicholas and City Grocery sous chef, Kirk Lovejoy will be manning the kitchen. Like many Oxford residents, Currence realized a need for another spot for those who get up early enough to partake in breakfast… or late enough to catch brunch. And Big Bad Breakfast has it all. 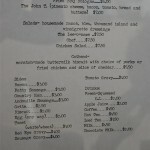 The menu features mainly local ingredients from suppliers with whom Currence has already cultivated relationships through the Farmers Market. Currence along with food writer and Southern Foods Alliance director, John T. Edge, were instrumental in hatching Oxford ‘s Farmers Market which brings locally grown fruits, vegetables, sausage, herbs, cheese, bacon and their suppliers conveniently within a hundred yards of the restaurant every Saturday. BBB will use dairy products from Billy Ray’s Farm in Yocona, eggs from cage-free local suppliers, Mississippi State cheese, and herbs plucked from an organic garden out back. 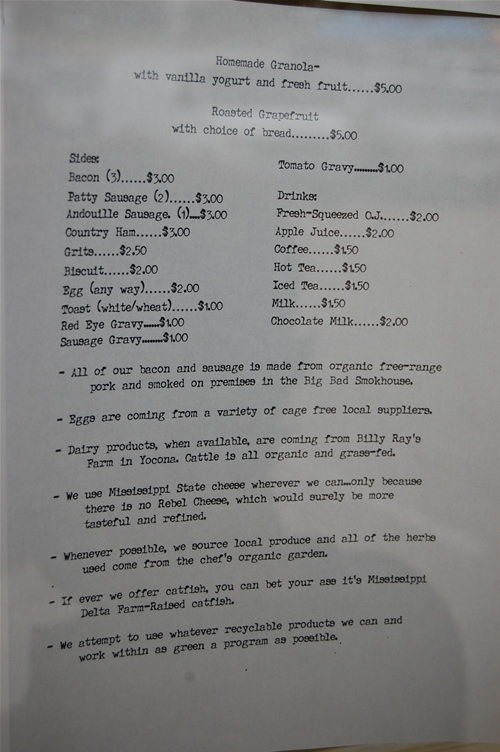 All bacon and sausage will be smoked on premises and will be made from organic, free-range pork. Chefs Lovejoy & Nicholas will turn this bounty into a variety of omlettes, country ham, brandy-spiked French toast, pancakes, biscuits and, of course, grits. 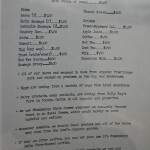 Even the lunch menu will feature a couple breakfast items, in addition to fried hot dogs, burgers, Coca Cola-brined fried chicken and sandwiches. 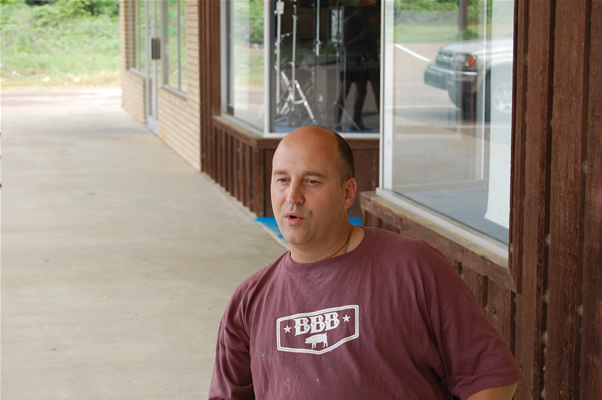 As with City Grocery and Boure, you’ll find south Louisiana ’s influence on the food at BBB. 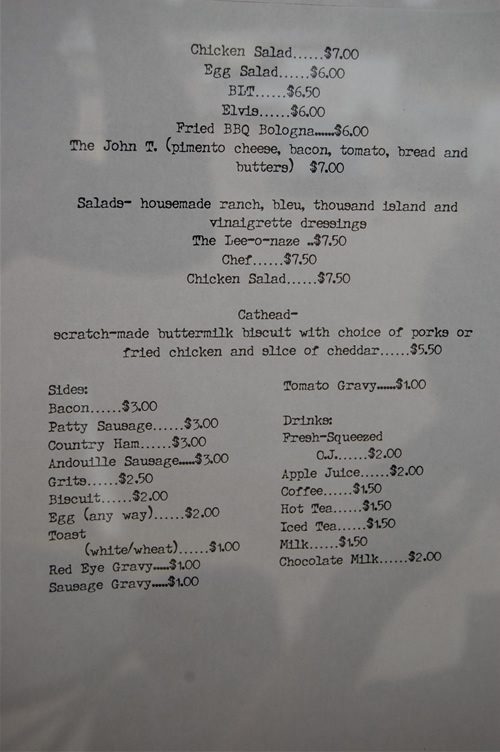 The menu features homemade andouille (a spiced and heavily smoked pork sausage and a favorite in the Cajun kitchen). 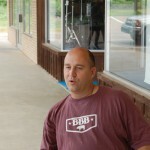 The restaurant’s bacon is cured at least a week in BBB’s on-premise smokehouse then smoked for half a day. During the process, the bacon is rubbed with a byproduct of Tobasco which should add a distinct flavor. Slabs of the bacon will be available for purchase. It’s hard to keep Currence away from his New Orleans roots. 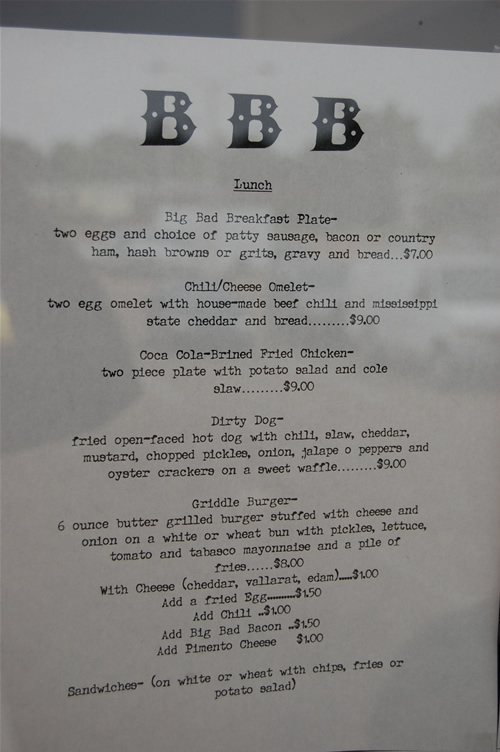 BBB was inspired by a fabled New Orleans diner, The Camilla Grill – an Uptown mainstay where you are as likely to wait in line midnight as you are at 10 a.m., for a chance to mac down on burgers, fries, pancakes or omlettes. 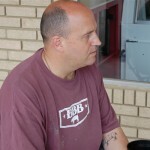 Like at any good diner, BBB patrons will be able to belly up to the counter as one family did when I was there. So another place for breakfast finally comes to Oxford . I am glad it is a new addition to the Currence Empire. 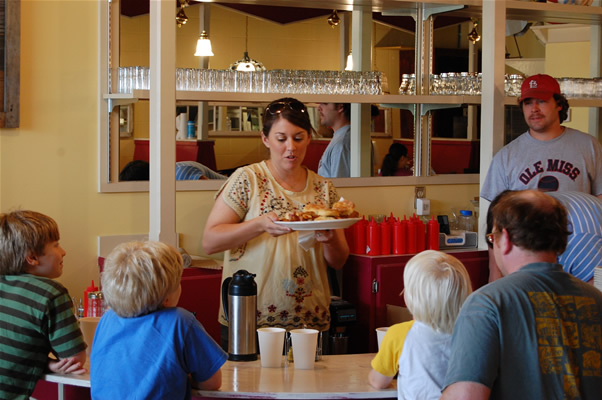 Having grown accustomed to waiting in line for breakfast at places like Bottletree Bakery, Smitty’s, Cracker Barrel as well as New Orleans faves Camilla Grill and Bluebird Café, I still can’t help but wonder why it took so long. 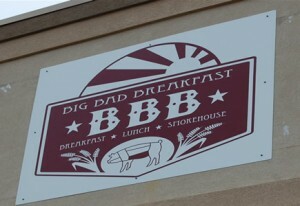 Big Bad Breakfast will be open from 6 a.m. until 3 p.m., and unlike Chic-Fil-A and The Beacon, will be open on Sundays. Good story. I didn’t realize Currence was responsible for Ajax and Kalo’s. Gosh, I miss Kalo’s. Glad to hear the farmers market is still going. How many vendors were out? (I was there with Derek)..
Gosh, though, I guess there were around 15 or 20 there? Nice article….you doing some freelance writing? I’ll forward to my parents. Look forward to getting back down there soon. Good Food and Good Times are always had in Oxford and I’m happy to see that people want to continue that tradition as Oxfordtown grows! 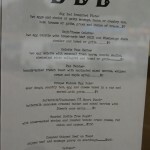 News from the front… I just had lunch at BBB and it was awesome. I had the burger with swiss cheese, added the soon to be famous bacon, with fries on the side. Then had a few bites of the chess pie. Yes, I feel a nap coming on. Mmmmm. Chess Pie. Like saying “Abracadabra” to my heart. I’m so glad someone drew my attention to this place! I can’t wait to try it. 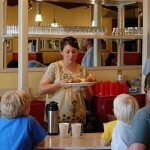 I agree: Oxford has been due for another restaurant that serves a good breakfast. I had a great breakfast there the other day. Luckily I did not see Moreton until after I’d eaten so I had a healthy appetite going in. I just had a burger for lunch there today. Goood. Mooon Piieeeeee! Ever incendiary. Beware- the internet is my oyster. Oh, this sounds to me like Smitty’s-style breakfast! The kind where you don’t have to eat the rest of the day (and what meal could possibly top it anyway?). I have got to tell my still-in-Oxford family about this if they haven’t already been…I’ll be sure to stop in next trip home! made my 2nd visit there for breakfast this morning specifically to order the bacon! it is the best i have ever had! i am not kidding— has anyone mentioned the homemade jelly yet? i think i tried every flavor, but raspberry is my favorite. was in oxford to breed one of my dogs..searched for a diner/cafe for half-hour , at least..the beautiful gals at the bookstore on the square set me straight…”Big Bad Breakfast is on the left just past the funky stoplight”..ordered the platter plus an extra biscuit and grits and taters..outstanding !…wish it was closer to Oklahoma.